In this case we were able to correct the non-uniform tooth shade of restorations and also restore the missing gum tissue between teeth. The front teeth had previously been discolored by trauma, infection, and failing restorations. Porcelain veneers allowed us to re-establish the uniformity in color and shape once again. Severe crowding and loss of gum tissue made this a challenging case to restore. We were able to deliver the patient an excellent outcome by using porcelain veneers and crowns to straighten the teeth and recontour the gum tissue. This patient presented with congenitally missing lateral incisors. We placed implants and porcelain crowns to replace the missing teeth, all while preserving proper gingiva contours. Heavy areas of decay and staining on this patient's front teeth as well as a missing tooth created a complex treatment. By placing an implant and restoring the front teeth with porcelain crowns and veneers we gave the patient a very esthetic smile. Older failing fillings and crowns were replaced by using porcelain veneers. We were able to achieve a uniform shape and color in the teeth but also better gingival contouring that made the front teeth look more natural. This patient's natural smile showed too much gum tissue in their smile. By surgically recontouring the tissue we were able expose more of the patient's natural tooth surface and give the smile they were meant to have. In this case we were able to correct the patient's wear on their teeth that left them with irregular shaped and darkened teeth. 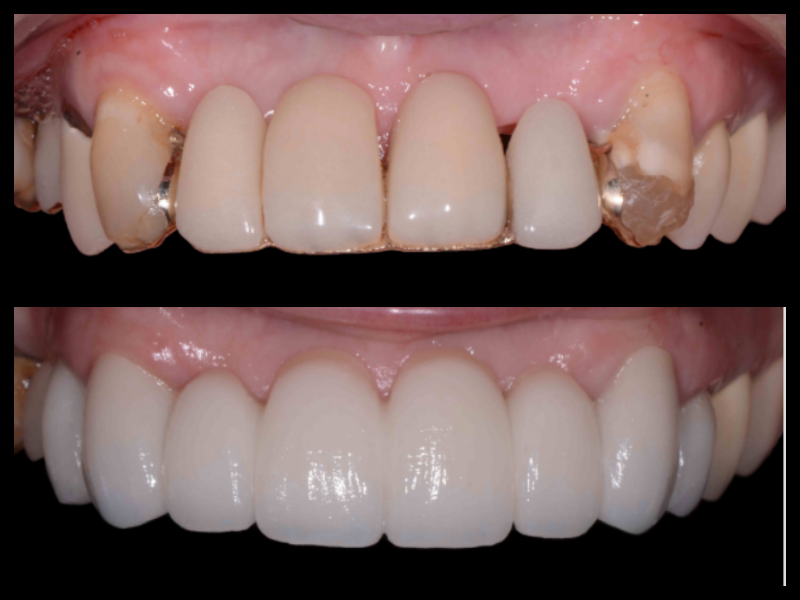 Porcelain veneers allowed us to correct the patient's smile architecture so the teeth looked more ideal.